If it is your only outdoor living space, it is even more important to make your deck as functional and comfortable as possible for all of the members of your family. And, even if you have other outdoor spaces, the views, privacy, or convenience of your roof deck might make it the best choice for your primary outdoor living area. This is one of the reasons you might be considering installing artificial grass over part or all of your deck. Using synthetic turf in this setting allows you to enjoy the look, feel and function of natural grass without the weight of soil or the extensive maintenance required to keep natural grass looking good. You are also able to avoid the inevitable bugs and weeds that come with having soil and natural grass on your roof. 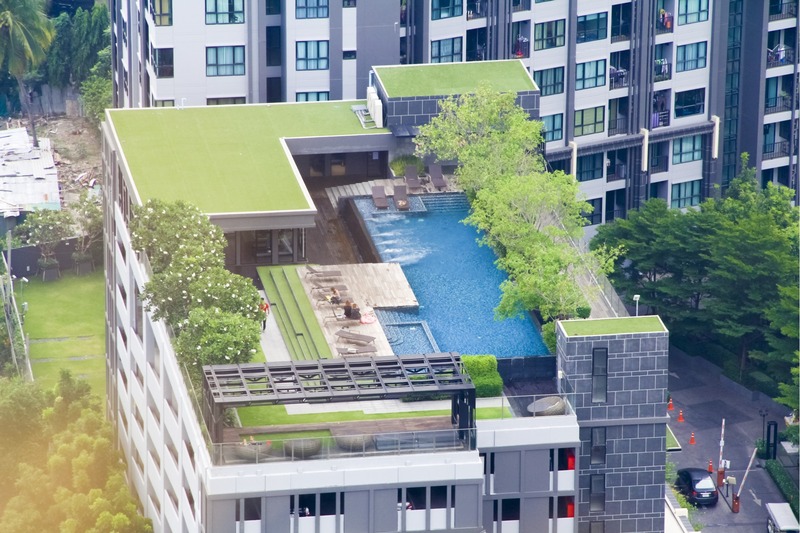 Next, let’s take a look at some of the benefits of choosing synthetic turf for roof decks. 1. Manufactured turf can be installed on almost any solid surface, including the concrete, composite decking or wood decking that is common on roof decks. 2. Artificial grass does not weigh as much as a natural grass lawn with soil. 3. Living ground covers come with some unwanted issues, such as increased insect activity, which you can avoid with fake grass. 4. Artificial turf does not fade, so it will continue to look lush and green after years of direct sun exposure. 5. Fake grass drains as well as or better than natural grass, even on rooftops (when properly installed). 6. Because it drains quickly, you can use your deck right after rain. 7. Artificial grass can withstand heavy traffic, so it is ideal for outdoor entertaining areas. 8. Synthetic turf is more comfortable for pets and children to play on or hang out on than concrete or decking materials. 9. It can transform your deck into a beautiful, functional outdoor living area. 10. It is much more attractive than concrete. 11. Fake grass can withstand years of rain, snow or hail without being damaged. 12. 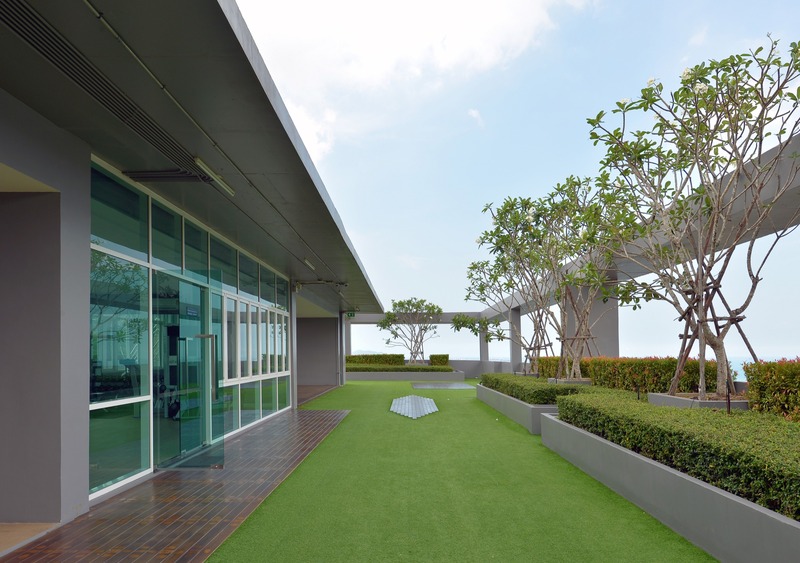 With artificial turf, you can have a putting green on your roof. 13. If you choose synthetic turf instead of natural grass, you do not need to worry about having a water supply to the roof, dragging some type of mower upstairs, or using pesticides and herbicides. 14. Installing fake grass on part or all of your rooftop deck is a great way to create a pet restroom area, particularly if this is the only outdoor space for your home. 15. Artificial grass is easy to clean and requires minimal maintenance to keep it looking lush and inviting. 16. Your children or pets can play on your fake lawn right after rain without tracking mud into the house. 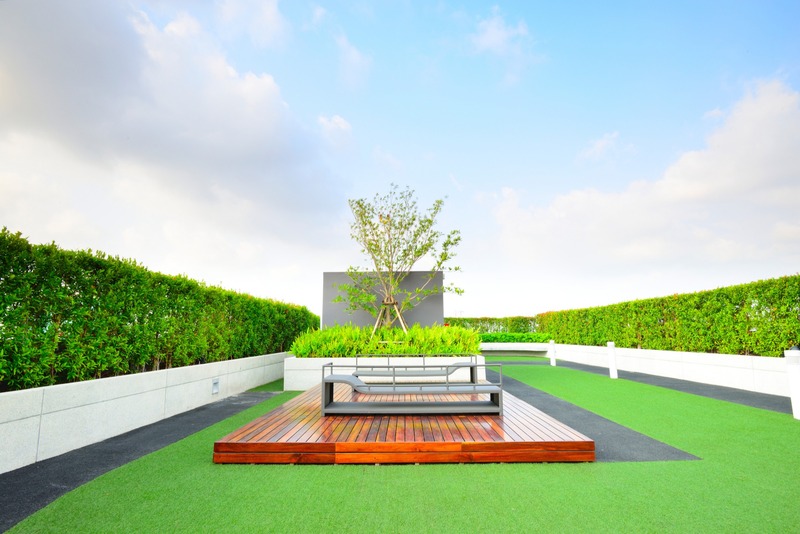 It is clear that there are many benefits to choosing artificial grass for roof decks, and this option can help expand the usable living space of your home. It is an area that you, your children, your guests, and your pets can enjoy any time of year. But before you schedule your installation, there are a few things that we want you to consider to make sure this is the right solution for your space and to ensure your long-term satisfaction with your fake grass. The first and most important consideration is the load-bearing capacity of your roof. This is usually not an issue with newer construction, but if you live in an older home or building, this is something to look into. If possible, talk to the builder to confirm the weight capacity of the deck. If this is not possible, you can have a structural engineer inspect your roofing system to determine how much weight it can bear. This is a necessary step before installing any type of rooftop deck material or filling your roof with potted plants or patio furniture. You need to be sure that your deck can hold the decking material, people, furniture and accessories you plan to have on your roof. Artificial grass is a lighter-weight option than most other choices, so it should not be an issue, but it is still important to confirm this first. The next thing to consider is that we do not recommend using fire pits or barbecue grills on synthetic lawns. This is because your grass can be damaged from hot surfaces or embers. If this occurs, your lawn can be repaired, but it is always better to avoid these issues by simply not using cooking grills or fire features on or near artificial grass. If you would like to use your deck for cookouts, you may want to consider installing fake grass in a smaller section of the deck so that your children or pets will still have grass to enjoy. If you currently have a wood deck on your roof, you will need to consider the possibility of the wood rotting under the artificial grass. If you plan to install turf over the wood deck, proper drainage and airflow is essential to help avoid this. Rooftop decks require proper drainage, regardless of the type of decking. Before installing artificial grass, it is important to check for any existing drainage issues. If you currently have issues with water pooling on your rooftop deck or with any other drainage problems, these should be corrected before installing your new lawn. You should also discuss any potential drainage issues with your grass installer, who can help ensure that your lawn will drain properly. This is partially accomplished by installing drainage tiles under the grass that allow the water to flow to the exit drains. If you plan on using your rooftop lawn as a pet restroom area, it is important to make sure that area allows liquid to flow to the exit drains unimpeded. Additionally, while artificial grass for rooftop decks can be installed as a do-it-yourself project, we really recommend professional installation. There are a lot of factors to consider, and an experienced installer brings the knowledge and skills necessary to address potential issues. For example, wind can be an issue on rooftops, which might make you want to use more glue to hold down the grass, but using too much glue can significantly affect drainage. A professional installer can also make recommendations to make sure your lawn suits your needs. He or she will use the right amount of infill in different areas to weigh down the grass and provider a softer foot feel, recommend the right drainage tiles to allow for the flow of air and water, and help you choose the right artificial grass product for your project.